As a global leader in the flavor and fragrance industry, Mane opened its North American headquarters in Lebanon, Ohio in 2014 — an award-winning 85,000 square-foot building that houses its corporate headquarters and state-of-the art R&D center. As part of leadership’s commitment to the facility’s refined architecture and the unique demands of its food laboratories, Mane retained GSF OHIO as its building services contractor. From the outset, the GSF OHIO team developed customized cleaning and training protocols to ensure exemplary handling of the building’s sophisticated floor work and food safety demands. GSF OHIO Floor Technician Albaro Velasquez and GSF OHIO crew member Dora Diaz maintain the custom-designed terrazzo floors in the public areas at Mane Inc. with a unique cleaning program. When Mike Christensen, Facilities Engineering Manager at the Addison School District in suburban Chicago, reached out to GSF ILLINOIS in late 2014, he was in need of replacing the District’s janitorial services company provider during a one-week period over the year-end school holidays. 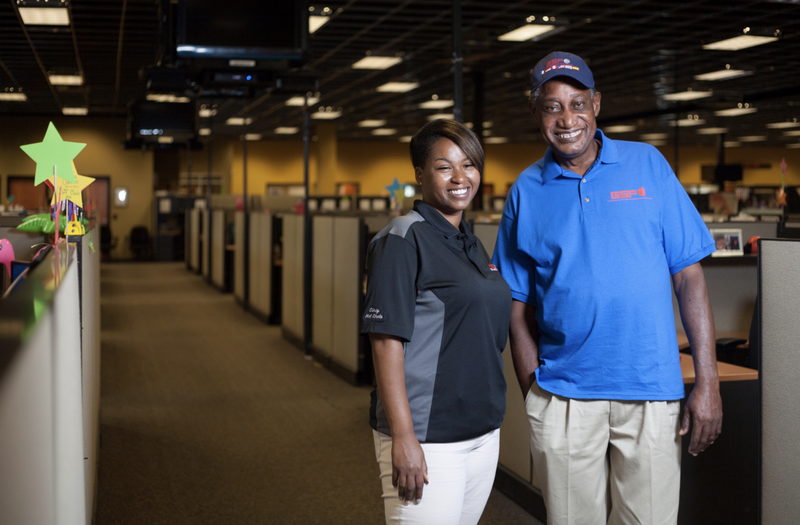 The GSF ILLINOIS team put a transition plan in place and by the time the students returned in early 2015, our new staff was up and running. Stretching 500,000 square feet over nine K-8 schools, the Addison School District serves 4,300 students. 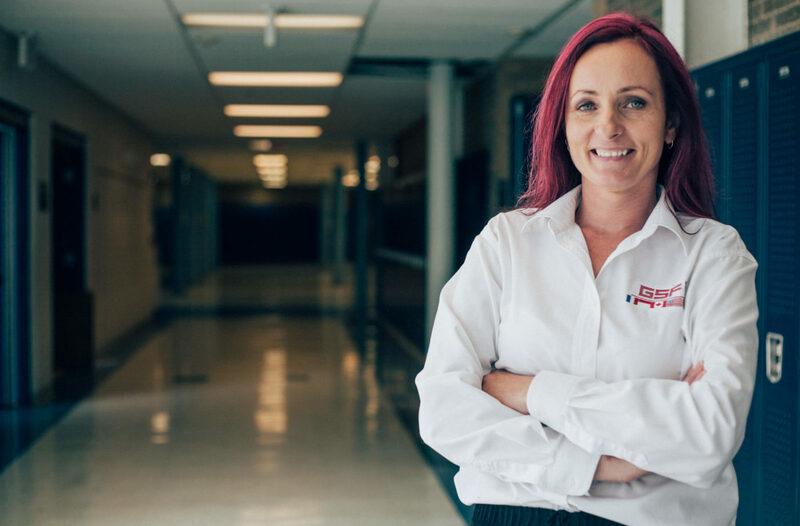 Since the schools are multi-use buildings — including classrooms, cafeterias, nurses’ offices, gymnasiums and computer labs — we leverage our breadth of experience in cleaning in a variety of facilities including restaurants, medical centers, arenas and data centers. Barbara Majka, GSF ILLINOIS Area Manager, oversees all operations for the Addison School District account. As a result of her hands-on approach and commitment to the client, she has built the 30-person crew, groomed staff to take on supervisory and management roles, and established new standards of excellence. A landmark building on the Indianapolis skyline, 300 N Meridian rises 27 floors above street level in Indianapolis’s central business district. Constructed in 1989, the building has more than 510,000 square feet of mixed-use space and 348,000 square feet of Class A office space, anchored by international law firm Faegre Baker Daniels LLP. GSF INDIANA’s service at 300 N Meridian began in 2005, and over the past 11 years our partnership with property manager REI Real Estate Services has blossomed. Our tenure with this prestigious account highlights our business model to consistently provide exemplary services at market pricing to forge valuable partnerships between our management staff and our client. Our focus on people, communication and building relationships combines with our service model to align perfectly with REI’s desire to anticipate problems and resolve them with speed, efficiency and professionalism. 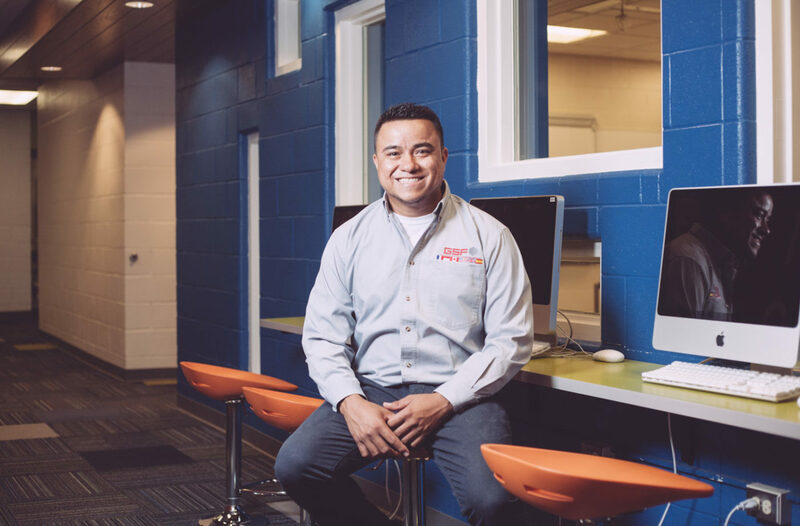 Adan Valencia, the Account Supervisor, leads the 300 N Meridian team in new employee onboarding, project completion and monthly inspections of the building’s largest tenants. 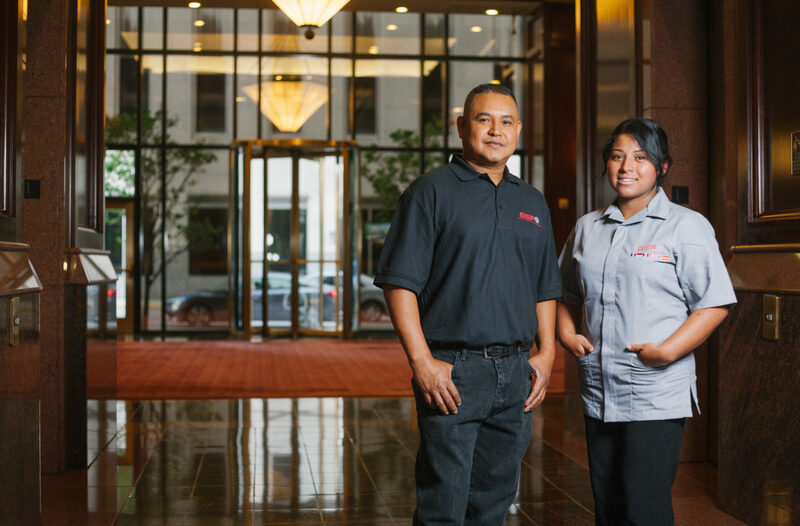 Anilu Perez has 12-plus years of employment with GSF INDIANA, which has lead to her highly-visible position of Day Porter at 300 N Meridian. Anilu meets with the building’s property management company regularly, and is the direct point of contact for tenant services during business hours. schools – Tripp Elementary School, Pritchett Elementary School, Meridian Middle School and Aptakisic Junior High School. GSF ILLINOIS began working with the District in 1998, and in 2005 we formalized our long-term partnership. 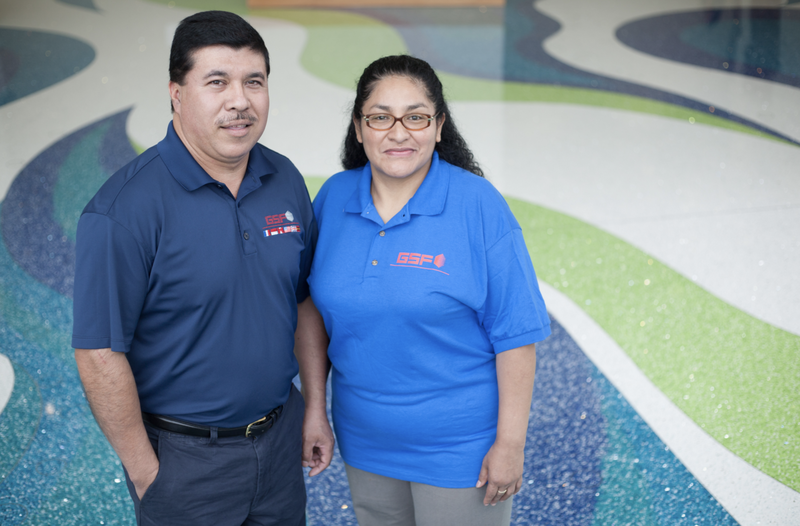 Today, GSF ILLINOIS empowers a team of 20 full-time staff to maintain all of the District’s facilities — cleaning carpets, floors, windows and other surfaces to ensure each building is sanitary and orderly for the next school day. 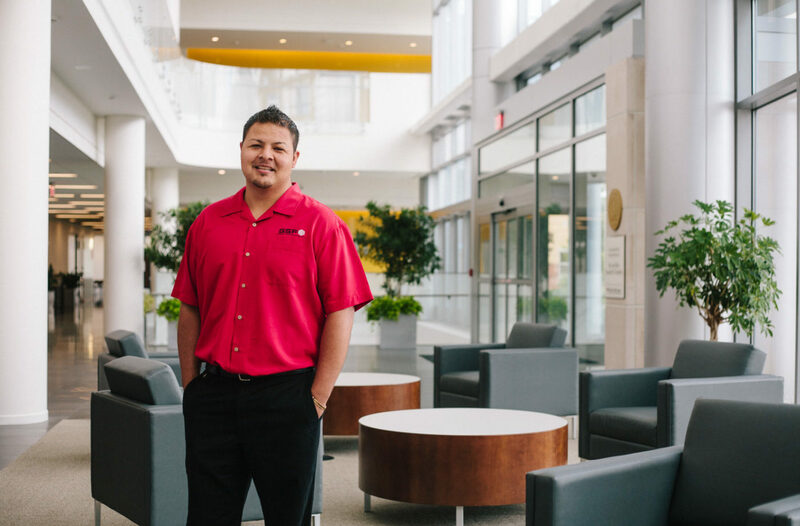 Olman Cartagena, Account Manager, has been on staff at GSF ILLINOIS for over ten years. Under his leadership, Olman has forged an outstanding relationship with the District’s administrative team and with the local school facilities managers to elevate and maintain exemplary levels of service.